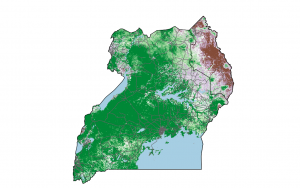 Map of Uganda showing vegetation productivity. Underlying data is the MODIS 2014 NPP Product, MOD17 – Zhoa et al. (2005). Uganda is a landlocked country of just over 240,000 square kilometres. Agriculture is a key element of the country’s economy and was responsible for 23% of gross domestic product in 2011 and almost half the country’s exports the following year. According to the Food & Agriculture Organisation of the United Nations, 80% of the population relies on farming for its livelihood. It has an equatorial climate, with regional variations, although recent recurrent dry spells have impacted on crop and livestock productivity. Pixalytics is delighted to be part of a consortium led by the RHEA Group, working with the Ugandan Ministry of Water and Environment and local NGOs to develop a Drought and Flood Mitigation Service (DFMS) to give practical information to help local communities respond to the effects of climate change. Using computer models populated with satellite, meteorological, water resources and ground based data an innovative Environment Early Warning Platform will be developed to provide Ugandan farmers, via local NGO organisations, with forecasts throughout the growing seasons to enable them to take actions to maximise their crop yield. Pixalytics, along with fellow consortium member, Environment Systems, are responsible for the Earth Observation data in the project. We’ll be looking at variety of optical and radar data to provide information about flood and drought conditions alongside crops and their growing conditions. Improving the ability to forecast and mitigate droughts and floods on a local actionable scale. Allowing NGOs to target resources saving time, money and lives. Allowing farmers to improve their lives and better protect their livestock and crops. Alongside ourselves, and RHEA Group, our consortium includes Environment Systems, Databasix, AA International, AgriTechTalk International, HR Wallingford, UK Met Office, Mercy Corps, and Oxford Policy Management. We will also work with international partners, including the Uganda Government Ministries, Kakira Sugar Company, and the NGO Green Dreams/iCOW. The first of a number of visits to Uganda took place last week, where we had the opportunity to make lots of local contacts and meet some of those whom we hope to benefit from this work. This work is part of the UK Space Agency’s International Partnership Programme and ours is one of 21 projects chosen to provide solutions to local issues in counties across Africa, Asia, Central and South America. This is a really exciting project to be involved with, and we’re looking forward to providing useful information to local farmers to allow them to take real and meaningful action to enhance the productivity, and protection, of their livestock and crops. This entry was posted in Data, Earth Observation, Flood Mapping, Modelling, Remote Sensing, Space Can Help, Space Industry, Uganda IPP, UK Space Industry, Understanding Space and tagged crops, DFMS, Drought & Flood Mitigation Service, Earth Observation, Environment Early Warning System, farmers, International Partnership Programme, livestock, local communities, pixalytics, RHEA Group, satellite, Uganda, UK Space Agency by Andy. Bookmark the permalink.